Americarpet: How Is Carpet Made? So, you’re curious about how things are made. Good for you -- it pays to know how carpeting is constructed. Because that knowledge can help you decide if carpeting is a flooring solution for the way you live. Just remember this: when selecting carpet, thicker is not always better. What you need to look at is the construction of the carpet. You want a tight twist in each yarn, not loose and frayed at the end. Like the hair commercial on TV, you don’t want split ends in your carpet either! But we’re getting ahead of ourselves. To start at the beginning, check out our construction story that follows—and happy learning! Today’s healthiest carpets get plenty of fiber. You can rely on nylon. 70% of carpet today is made of nylon and, compared to the other fibers below, it performs the best overall. Nylon is the leader in: appearance retention, fade and heat resistance, soil and stain resistance, and color and styling. The highest performance nylon is Type 6.6, which has a tighter molecular construction, making the carpet more resistant to stain penetration. Go slow, long word ahead. The next most common material used in carpet manufacturing is polypropylene, also referred to as olefin. 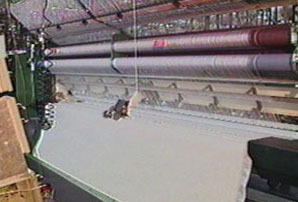 Introduced in the late 1950’s in Italy , polypropylene BCF has seen fast growth over the last twenty years, and today represents more than thirty percent of the total fibers used in the carpet industry. The production of carpet, a 3-part epic. There are basically three steps to manufacturing carpet. The first step is what is called tufting. Tufting begins with the process of weaving the synthetic or staple fiber into a primary backing material. The primary backing material is usually made of woven polypropylene, and its main value is to provide a base cloth to hold the yarn in place while the tufting happens. The tufting machine looks like a really big sewing machine. 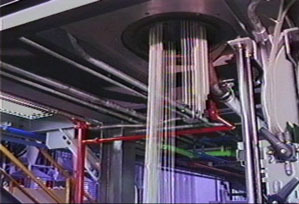 It has anywhere from 800 to 2000 needles working in concert to pull the yarn through the primary backing material. 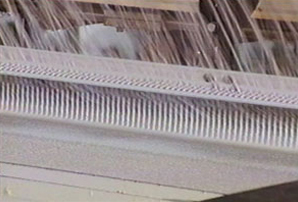 The typical tufting machine sits about 12 feet wide, and as its needles penetrate the backing, a small hook called a looper grabs the yarn and holds it in place. 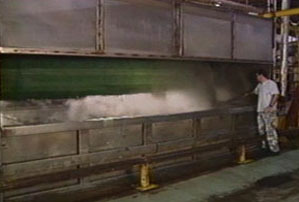 This process results in what is called loop pile construction. Now let’s pause in our construction story to identify and explain some terms and construction variables that you will encounter while making a carpet purchase decision. The second step of carpet manufacturing is to dye for. And the third and final manufacturing step is the finishing process. In the finishing process, a coating of latex is applied to both the tufted, dyed carpet’s primary backing, and also to secondary backing. Secondary backing is typically made of a woven synthetic polypropylene material. The two parts are squeezed together in a large heated press, where they are held firmly to preserve their shape. That’s the story on how carpet is made. We hope it helps you be a more savvy shopper. If anything, now you can throw the word “ polypropylene” around at the party to celebrate your home’s beautiful new carpeting. The following article was taken directly from The World Floor Covering Association (www.wfca.org). Please visit our other sites at www.americarpetfloors.com and www.stylishrugs.com.